Discover Dogs is held by The Kennel Club twice a year in March and November. In March it is held at the NEC, Birmingham at Crufts and in October at ExCel, London. Breed clubs are asked to provide volunteers to bring along their dogs and promote their breed. We have manned the stand since 2007, at both venues and it is a brilliant place to come and meet Swedish Vallhunds “in the flesh”. The dogs really enjoy being the centre of attention and many people have chosen Vallhunds as their breed after meeting them for the first time at Discover Dogs. The people who man the stand really enjoy talking about our lovely dogs, so please come along and say “Hello”. Our Discover Dogs coordinator Sharon Sibley is always looking for volunteers, so if you’d like to help out on one of the days please contact her. The Eye Panel Working Party of the British Veterinary Association (BVA)/Kennel Club (KC)/International Sheep Dog Society (ISDS) Eye Scheme has decided that the Swedish Vallhund should move to Schedule A for Retinopathy from 1st January 2018. Breeds move to Schedule A (indicating that the condition is inherited in the breed) based on scientific evidence including a prevalence of at least 1% over a minimum three-year period and/or peer-reviewed scientific literature. 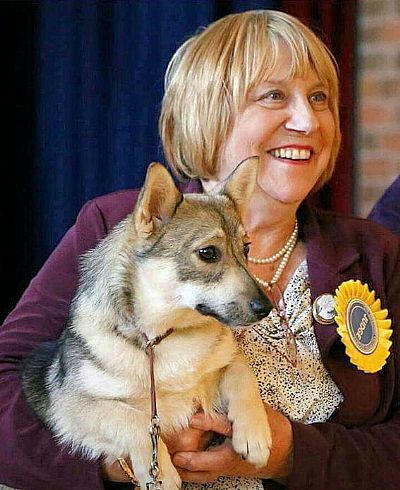 Recent research by Dr Sally Ricketts and Dr Cathryn Mellersh and her team at the Animal Health Trust has revealed a relatively high prevalence of retinopathy in the Swedish Vallhund in the UK and clear evidence that the condition is inherited as an autosomal recessive trait. Your breed’s enthusiastic participation in this research is to be applauded. A paper describing the mutation is in press; I would be happy to send you a copy when it becomes available if you wish. Regular eye examinations of dogs of the breed may be helpful, however it is DNA testing for the mutation responsible for the condition that is the essential strategy. Swedish Vallhunds which have a DNA test result of clear or carrier for the POAG mutation will not develop this condition but would still benefit from participating in the Eye Scheme as clinical examination may detect other ocular conditions of relevance. Please contact me or the Health Team on mateselect@thekennelclub.org.uk if you need further information or for specific Eye Scheme information please contact the Canine Health Scheme on 020 7908 6380 or chs@bva.co.uk . The Kennel Club has now approved the new DNA test for Retinopathy for Swedish Vallhunds. This means from now on when a dog is tested by an approved lab (such as the AHT) the results will be sent to the KC and recoded on the dog’s registration and can be checked on the KC Health Test Finder. Dogs that have been tested previously may need to send in a copy of their certificate to have their results recorded. The Animal Health Trust has now released the new DNA test for the mutation associated with Retinopathy in the Swedish Vallhund. The Society would like to thanks all the people at the AHT for their hard work and to thank all the owners who's dogs were part of the research. For more infomation on the mutation found click here. The test is simple to use, requiring only a cheek swab and can be ordered directly from the AHT. To order a test kit click here.